5A Mains cable with Figure 8 plug designed for great performance in low power equipment, suitable for source components and smaller amps. Also available with Standard Plug. Black Rhodium Libra 5A mains cable has a figure of 8 connector and is twisted internally along its length preventing the loop "aerial" effect causing audible distortion to sound quality. It has been designed with low Transient Phase Distortion achieved by increasing the thickness of the inner insulation to 1.2mm. 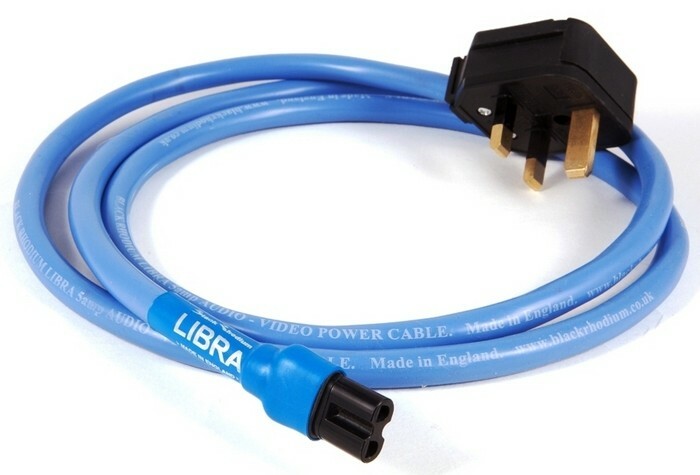 Libra is designed for use with low current equipment such as CD players, turntables, preamplifiers etc to deliver the very best sound without the expense of giving the cable a high current carrying capacity. Suitable for equipment requiring less than 5A continuous current, it shares many of the features that have made previous power cables by Black Rhodium popular among high-quality equipment users. A silicone rubber insulation ensures extremely low distortion due to the dielectric absorption effects in which sound energy is absorbed in the insulation and released at a later interval to create highly audible time-smearing distortion. 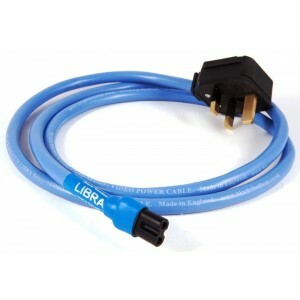 Libra's flexibility makes it much more convenient to use than cables that are less flexible. The positive and negative cores are connected in opposite directions so the noise floor between the musical notes is lowered. The result is ‘blacker’ silences between musical notes and enhanced reproduction of the musical edges and natural decays in music. When two electrical conductors carry an electrical current, the magnetic field produced by the current in one affects the resistance of the other, known as the Proximity Effect. The loudspeaker load is reactive so the current and voltage in the speaker cable are not in phase and the modulation effect produces a Transient Phase Distortion signal that distorts sound quality. The benefit of thicker insulation is that it moves the conductors 2.4mm from each other so the magnetic field (which reduces inversely proportionally to the distance) on the other cable is lowered and the ‘Transient Phase Distortion’ is less audible. This 5A Mains cable with figure 8 connector is suitable for source components and smaller amplifiers. If in doubt, use one of Black Rhodium's 13A mains cables.